The Amish Mission Small Console Curio Cabinet is a solid wood treasure itself! Don't let treasured collections remain in the dark confines of the attic or basement. Bring them out and create a stunning display, with keepsakes featured on the glass shelves of the Amish Mission Small Console Curio Cabinet. Share stories about the items that have become part of your family history. This mission curio cabinet is Amish made to become a treasured keepsake itself. Mission style furniture remains popular throughout the years, offering a simple style with little decoration. This beauty in simplicity allows the solid wood you select to shine. Explore more mission style furniture pieces here. 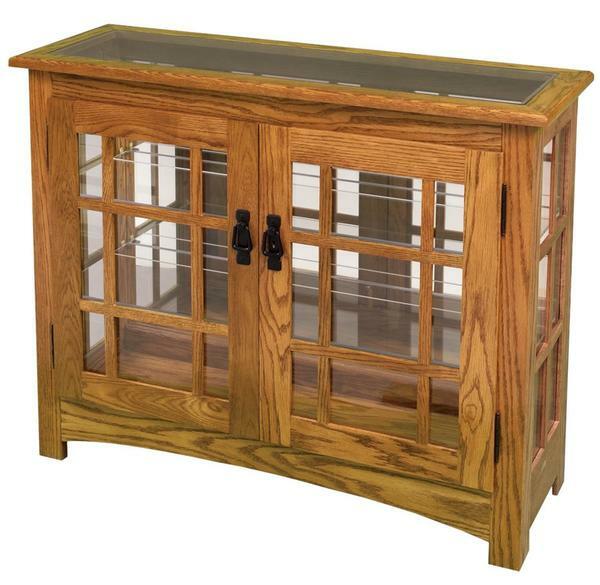 Customize this console curio cabinet with your choice of wood, stain, and hardware. Consider additional shelves to hold more items. This custom made curio can remove the mullion detail if you wish. Call us today, toll-free at 866-272-6773 with any questions about our Amish furniture.